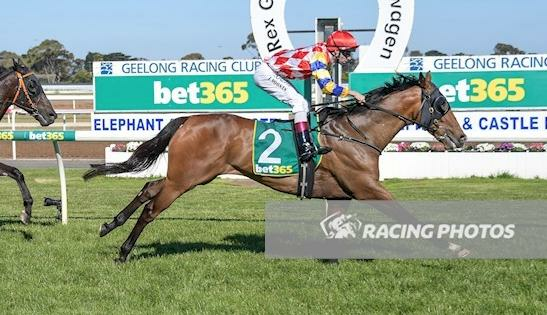 With bold front-running tactics at Geelong this afternoon, jockey Jake Noonan made every post a winner to secure a strong win aboard Dominant Witness for father Tony Noonan. Stepping up to 1500m, the distance proved no worry for the 4-year-old Star Witness gelding. Jumping well from the gates and with no other horse keen to push forward, Noonan took the initiative upon himself to lead the field down the back straight unopposed. Getting away with highway robbery unchallenged, dictating the race on his terms, Noonan quickly opened up an 8-length margin through the bend before balancing up in the home straight, still 6-lengths in front. Angling towards the centre of the track with others in the field off the bit, Dominant Witness ($8.50) gave a strong kick to comfortably box on for a 1.25L win ahead of the fast-finishing Smooth Celebration ($7). The win came in stark contrast to Dominant Witness’ maiden win when coming from last on the turn, also with Noonan in the saddle.